Equine photographer Tony Stromberg conducts photography workshops around the world, from the American West to the South of France. His new book, Horses (teNeues) features a collection of his latest images from around the world. We took a stop in Morocco with some of his most fascinating photos. Here, he shares some insights on what it was like to photograph horses in Morocco. “My general impression of the horse culture in Morocco is mixed,” says Stromberg. “When we stayed in Marrakech, right near the markets and ‘souks,’ there were many horse drawn carriages that are used for tourists, but also for transportation by the locals. I was very impressed at the condition of the horses. They were very well cared for, in good weight, with nice coats, and their hooves were in perfect condition. But as we journeyed through the countryside, we saw horses in rural areas that were clearly ‘work’ horses, underweight and not in great shape. Stromberg explains that he and his team worked with a government agency called S.O.R.E.C., which educates people about the Barb and Arabian horses that are indigenous to Morocco, as well as offering a free breeding program to help create better quality horses throughout Morocco. The stunning cream-colored Lusitano in the slideshow above is one that Stromberg remembers well from his photo sessions in Morocco. Reverence to the horse is a still a common thread that unites people today across all cultures. Stromberg’s images speak to horse lovers with an appreciation of equine beauty that honors the spirit of the horse. Horses—just horses—are the focus of the latest collection of images from equine photographer Tony Stromberg. From the open spaces of the American West to stunning locations around the world, including Portugal, Morocco, France and Italy, Stromberg photographs horses in their natural state and portrays them with authentic grace and beauty. Mustangs, ranch horses and Arabians mix with Iberian horses and a variety of breeds in this visual homage to equine spirit. Stromberg’s work is described as a perfect balance between light and shadow. His use of lighting, paired with unique composition and feel for the right moment, captures the majesty of the horse. Yet most of all, it is his deep personal connection to the horse that makes his images come alive. 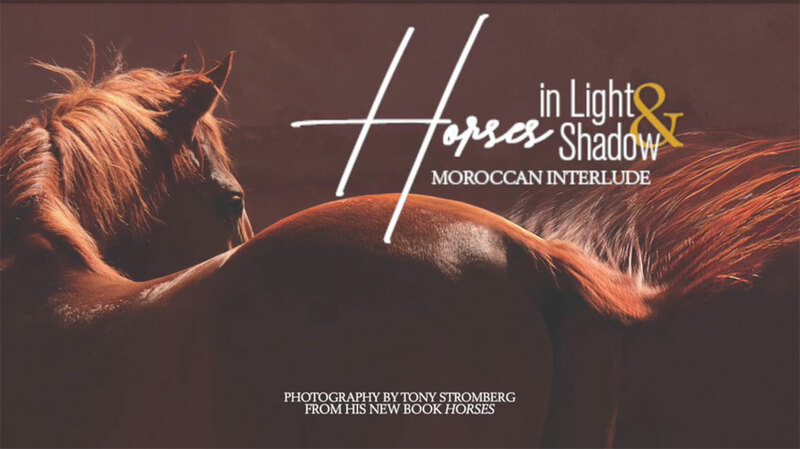 Tony Stomberg’s photography was featured in the November 2016 issue of Horse Illustrated magazine. Click here to subscribe! Great artist and his pictures are so beautiful. Love his work, please check out his links.